A genetic analysis of ancient and modern humans suggests that the ancestors of Native Americans entered the North American continent from Siberia some 23,000 years ago—and that they did so in a single wave. 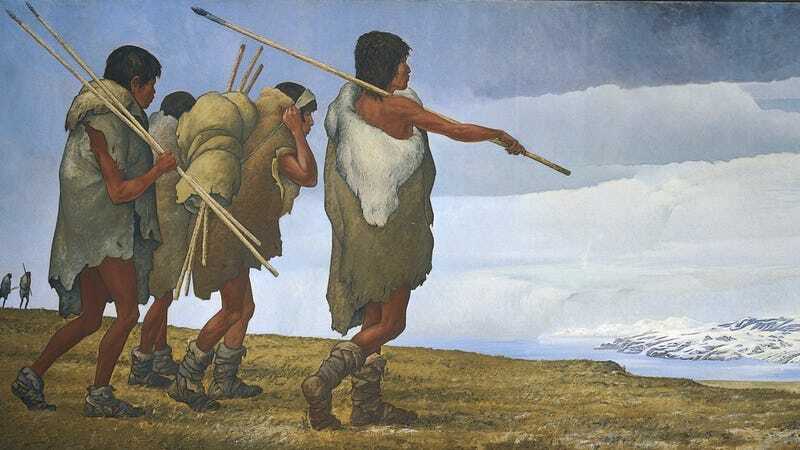 According to the new study, which now appears at Science, the original Americans came to North America via Beringia at the height of the last Ice Age, and they stayed in the north for potentially thousands of years before diverging into two distinct populations some 13,000 years ago. One group dispersed across North and South America, while the other stayed in North America. Credit: Raghavan et al., Science (2015). An international team of researchers reached these conclusions by sequencing and comparing the genomes of 31 living Native Americans, Siberians, and people from Oceania, and the genomes of 23 ancient individuals from both North and South America who lived between 6,000 to 200 years ago. The study challenges the assumption that an earlier wave of people from East Asia arrived in North America prior to the last glacial maximum, and that the continent was populated through multiple independent waves of human settlers. DNA analysis suggests that humans entered into North America no earlier than 23,000 years ago, and not 30,000 years ago as some archaeologists and anthropologists have speculated. What’s more, the study dispels the notion that Polynesians or Europeans contributed to the genetic heritage of Native Americans. The “single wave hypothesis” would also seem to imply that genetic differences in present-day Native American populations came about after migration, and are not the product of incoming waves of Asian populations. Fascinatingly, the genetic analysis revealed that both populations of Native Americans have a mixture of genes from East Asians and Australian Melanesians, including Papuans, Solomon Islanders, and Southeast Asian hunter-gatherers. But not everyone agrees with this interpretation. In a separate study, also released this week, professor David Reich from Harvard Medical School argues that there were multiple pulses of migration into the Americas. Credit: Pontus Skoglund, Harvard Medical School. The Willerslev study, on the other hand, makes the case that the traces of Australasian DNA are the result of a later migration, around 8,000 years ago along the Pacific coast. Contact the author at george@io9.com and @dvorsky. Top image by DEA Picture Library/De Agostini/Getty Images.